The outer ring surrounding the galaxy consists of gas and stars and rotates over the poles of the galaxy. 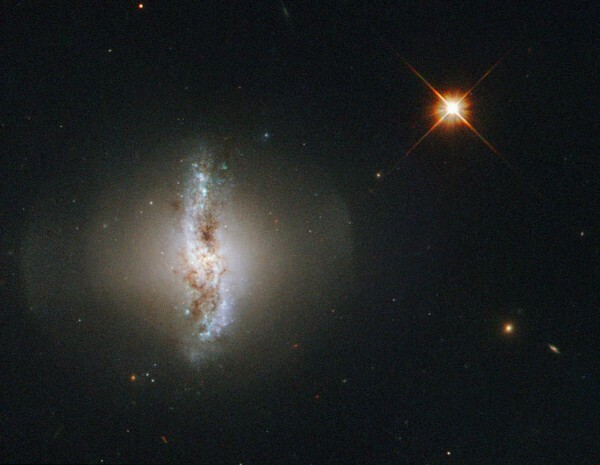 It is thought that the orbit of the smaller of the two galaxies that created Arp 230 was perpendicular to the disk of the second, larger galaxy when they collided. In the process of merging the smaller galaxy would have been ripped apart and may have formed the polar ring structure astronomers can observe today. Arp 230 is quite small for a lenticular galaxy, so the two original galaxies forming it must both have been smaller than the Milky Way. A lenticular galaxy is a galaxy with a prominent central bulge and a disk, but no clear spiral arms. They are classified as intermediate between an elliptical galaxy and a spiral galaxy.